Located on the beautiful Wimbi Beach, it's sometimes hard to reconcile the extreme natural beauty with the extreme poverty living right next door, but this is where Heidi Baker has been based since 2004 and is quickly developing into a large center. This is the location of the Holy Given Missions School held biannually in June and October. Consisting of 2 properties, it is home to 240 children, 160 student pastors, 30 long term missionaries and horses! Center 1 is housing for the long term missionaries and all the student pastors. Center 2 houses all the kids, and a primary school serving the community is located at the top of the land. The Bible School has 6 classrooms, and a big-top tent serves as the church. All the administrative offices are here, as well as Holy Given student and vistor accomodation. A widows program is run for widows and abandoned women in order to teach them some skills. There is a large vegetable garden which they are responsible for and where they grow enough to feed the center and their homes. Sewing classes are also given and women make simple african bags and capalanas to sell to visitors as an extra source of income. 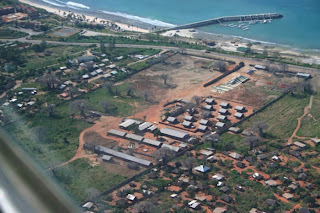 The Pemba center is equipped to welcome large numbers of visitors in a specially built compound. There are weekly evangelism outreaches and medical missions to nearby Mieze. Visitors are welcome to do arts and crafts or play games with the children, as there are no specific activities set out. You will have to bring your own materials for any crafts and a good imagination! There is electricity, and soon there will be running water too. "Two and half months of sitting in the dirt under an open heaven. Ten short weeks of being poured into by some of the finest leaders out there. A lifetime of relationships of people to fly with into God's unformed dreams... Disclaimer: God will change your life here if you let Him! He changed mine. I can never go back. I can never return. I cannot express how grateful I am to Him for what He has done in me in this place where African dirt mixes with heaven's glory. I have been in ministry for ten years, have had university level biblical training and NEVER have I encountered more profound teaching. This is categorically the best missions training I have ever gotten. But it is not the teaching alone that changes you-it is truth combined with Spirit. It is truth delivered with explosive encounters of His Presence, taught from lives laid down in love. Holy-Given is much more than a school. It is an encounter with the One Who was Holy-Given for us so we could be wholly-given to Him. Through Holy-Given, God gave me so much more than good worship times, wonderful revelatory insights and effective training, He gave me more of Himself. And He gave me family. I could never thank Him enough." After completing the school, Michelle went to the Sudan to serve with Iris. For those who would like to support me you may do so through the link on the right to PayPal or you may make a tax-deductible donation through Beulah PHC. Please make sure the address on your check is correct as this will be the address used to mail your statement.